Money, happiness and hedonic adaptation. The Economist ‘Free Exchange’ column had a piece on money and happiness in which they looked at research into how peoples level of happiness is relative to reference groups. In the mid 1970s Richard Easterlin drew attention to studies that showed that, although successive generations are usually more affluent that their parents or grandparents, people seemed to be no happier with their lives. It is an interesting paradox to study when you are writing about measuring economic welfare and the standard of living. What is the Easterlin Paradox? 1) Within a society, rich people tend to be much happier than poor people. 2) But, rich societies tend not to be happier than poor societies (or not by much). 3) As countries get richer, they do not get happier. Easterlin argued that life satisfaction does rise with average incomes but only up to a point. One of Easterlin’s conclusions was that relative income can weigh heavily on people’s minds. Recent studies that looked at countries over time concluded that more income leads to greater levels of happiness. However it wasn’t clear as to whether money leads to happiness or happiness leads to money. Over a period of time the effects of the increase in a person’s income wears off over time as the recipient gets used to the norm. Economists refer to this as ‘Hedonic Adaptation’. There were big differences in the levels of satisfaction but after a year the level of happiness of both the recipient and non-recipients returned close to its original level prior to the windfall gain. One interesting result was that villagers were not so concerned about inequality but the decline in their own wealth relative to the mean. Therefore a village could have great inequality as one group has got richer and another group poorer but the actual mean income remains unchanged. A study by Ada Ferrer-i-Carbonell entitled ‘Income and Well-Being: an empirical analysis of the comparison income effect’ shows that there is an asymmetry in the way people compare themselves with others. There is a tendency for people to compare themselves to those who are better off so we shift our reference group as our income goes up. Because of this we are never satisfied, since we quickly become accustomed to our own achievements. This entry was posted in Behavioural Economics and tagged Happiness on December 10, 2015 by Mark. Many have argued that money doesn’t buy happiness and the most prominent economist to write about this was Richard Layard in his 2005 book ‘Happiness’. Rich countries are no happier than poor ones – real US incomes more than doubled after 1950 while happiness flatlined – and across the chequerboard of nations happiness goes up barely a jot beyond a per capita income of $20,000. Why to we buy stuff? The Gilded Age in the 19th century was a time of industrialisation and consumerism with property being “anything that the individual may acquire which sustains and prolongs life…and gives an advantage over opposing forces” – The Psychology of Ownership by Linus Kline and CJ France. In Australia, the lion’s share of household debt goes to mortgages on the family home, and world-wide the two best selling items are soft drink and potato chips. In the name of property and calories we slay the credit card and kill our domestic bottom line. A certain Mexican beer takes you to a part of the world where you want to be – a beach with a beautiful sunset. A car company takes you to a ski resort amongst a picturesque Alpine environment. Products become substitutes for experience as you get delivered the feelings by association – virtual reality with consuming a product. With a brand meaning more pleasure for consumers it is no wonder that there is greater consumption which leads to overspending. The 5th edition of the American Psychiatric Association’s Diagnostic and Statistical Manual of Mental Disorders includes ‘excessive acquisition’ as a feature of ‘hoarding disorder’. And the brain scan data are in too: compulsive buyers light up the same reward centre that rats trigger with a lever, getting rewards until they drop. In getting used to the short-term feel good factor of material possessions, we shall over invest in acquiring them at the expense of our leisure. Consumers do underestimate the hedonic treadmill and as a result our life can be too focused on working and making money, and away from other pursuits. This entry was posted in Behavioural Economics and tagged Happiness, Hedonic Treadmill on December 6, 2015 by Mark. Is poverty about money or friends? In the World Bank survey one stated that “I like money and nice things, but it’s not money that makes me happy. It’s people”. Research has suggested that social integration is more important for well-being than income and it also decreases poverty. By contrast loneliness can be deadly – one study found that it did more damage to health than smoking. 1. Lower income groups end up living in different degrees of hardship depending on their intangible resources. 2. Having strong social integration reduce money hardship. 3. Friends and relatives can lend money, pool risk, mind children and bring news of job openings. However a lot depends on having the right friends as if this does not eventuate hardship prevails. The more concentrated the poverty, the less helpful social networks tend to be. A global survey conducted in 2014 by Gallup, a polling firm, found that 30% of people in the poorest fifth of their country’s population had nobody to rely on in times of need, compared to 16% of the richest fifth. Several countries have experimented with schemes that connect lonely old people and deprived youth. Germany, for instance, has built “multi-generational” community centres where older visitors get computer coaching from teenagers. This entry was posted in Behavioural Economics, Development Economics and tagged Happiness on June 23, 2015 by Mark. The course booklet has been edited so that answers to questions can be typed – this can be downloaded also from the iTunesU course. Click on the link below to enroll on the course. This entry was posted in Behavioural Economics and tagged Happiness on May 18, 2015 by Mark. 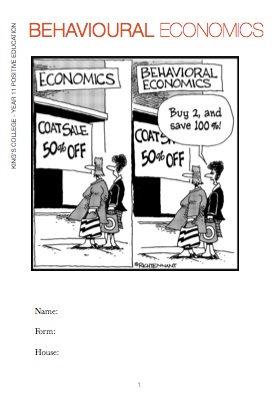 For the past three years I have been teaching a Behavioural Economics course to all Yr 11 students (5th Form in UK). It is a 12 period course that is part of the Positive Education module. The course booklet consists of lesson plans on various topics and resources that are required to supplement the course. Click below to download the course notes and workbook. If you would like the PowerPoints that complement the course please email me – m.johnston@kingscollege.school.nz – and I will forward them on. Ideal for those post AS exam lessons. Behavioural economics is about bringing reality into economic analysis. It borrows from psychology, sociology, politics, and institutional economics (which focuses on the rules of the economic game) to describe and explain human behaviour and economic phenomena. Behavioural economics builds upon conventional economics, offering more tools for understanding why people behave the way they do when it comes to income, wealth, ethics, and fairness. It uses prospect theory to describe the choices that the typical person makes. The course is split up into 4 topics and is designed for approximately 12 periods in length. Definition – what is it? This entry was posted in Behavioural Economics and tagged Happiness on February 9, 2015 by Mark. Although a few years old, this graph from The Economist does highlight New Zealand as a country which has one of the highest levels of well-being but a low level of GDP per person to go with. The trend line shows that the higher the GDP per person the better the level of well-being. Ultimately the challenge for politicians is to try and get their country to the top left of the graph – i.e. higher well being for less GDP per person. This entry was posted in Behavioural Economics and tagged Happiness, Wellbeing on May 7, 2014 by Mark. There has been a lot of research regarding how higher income = higher levels of happiness. Increasing your income increases your utility (satisfaction). But the more you have, your utility increases, but at a diminishing rate. At low levels of income increasing your income has a big effect on your utility. However when you have a high income more money does increase your utility, but not as much as when you started off with low levels of income. Introducing this diminishing returns framework into an analysis of happiness also suggests that increasing the income to the poorer members of society increases society’s total happiness by more than if the income of the wealthy increases by the same amount – see graph. Research has shown that a lack of money brings both emotional misery and low life evaluation; similar results were found for anger. Beyond $75,000 in the contemporary United States, however, higher income is neither the road to experienced happiness nor the road to the relief of unhappiness or stress, although higher income continues to improve individuals’ life evaluations.” The research does not imply that a financial increase will not improve the quality of life, but suggests that above a certain income level, people’s emotional wellbeing is constrained by other factors, such as temperament and life circumstances. The take home message of the research is that high incomes don’t bring you happiness, but they do bring you a life that you think is better. The Easterlin Paradox concerns whether we are happier and more contented as our living standards improve. In the mid 1970s Richard Easterlin drew attention to studies that showed that, although successive generations are usually more affluent that their parents or grandparents, people seemed to be no happier with their lives? It is an interesting paradox to study when you are writing about measuring economic welfare and the standard of living. 3) As countries get richer, they do not get happier. Easterlin argued that life satisfaction does rise with average incomes but only up to a point. One of Easterlin’s conclusions was that relative income can weigh heavily on people’s minds. What about the other way around – Happiness causes Income? An article by Scott Sumner (Library of Economics and Liberty) looked at this area and suggested that culture has an impact on happiness. According to Sumner peole who care about the welfare of others tend to be happier – this leads to more efficient policies, less corruption, acquiring governments handouts when they are not entitled e.g. the informal economy. 2) If you exclude the the two “size of government’ categories from the 10 categories used by the Hertitage foundation. Denmark has the most free economy in the world. Therefore it is a free market with a strong welfare state. As Sumner points out “not much (selfish) rent seeking” behaviour. Happy people aren’t selfish? China currently ranks extremely high in level of satisfaction but doesn’t exhibit an extremely high level of “euphoria” for everyday life. Can researchers distinguish between peoples incomes and euphoria? Think of the euphoria in the east of the collapse of the Berlin Wall or Spain winning the Football World Cup when they had over 25% unemployment. Ultimately a lot is dependent on when the research is carried out and culture of the people. You might not have much but newly regained freedom or being the best football team in the world gives immense pleasure. This entry was posted in Behavioural Economics and tagged Happiness on March 1, 2014 by Mark. An estimated 87 percent of people were ‘satisfied’ or ‘very satisfied’ with their lives overall. Four aspects of life were important in determining people’s overall life satisfaction: health, money, relationships, and housing. * 67 percent had no major problems with the house or flat they lived in. – 21 percent of New Zealanders had good outcomes in all four of these (ie excellent or very good health, more than enough or enough money, never felt lonely, and no major housing problems). – 98 percent of those with four good outcomes were satisfied or very satisfied with their lives overall. – 5.4 percent of New Zealanders did not have a good outcome in any of the four aspects of life. Of these people, 56 percent were satisfied or very satisfied with their lives overall. This entry was posted in Growth and tagged Happiness, Wellbeing on October 25, 2013 by Mark. A happier world since GFC? 1. Large, fast-growing emerging markets do not share share rich industrialised pessimism. The happy countries got even happier – Turkey, Mexico, and India. Incidently even considering the tsunami and the nuclear accidents Japan’s ‘very happy’ category increased. 2. Happiness levels tend to rise with wealth and then plateau – The Easterlin Paradox. This usually happens when a country’s national income per head reaches around $25,000 per annum. But the highest levels of reported happiness are in the poor and middle income countries – Indonesia, India, and Mexico. In rich countries the levels range from 28% in Australia to 13% in Italy and 11% in Spain. Most Europeans are gloomier than the world average. Levels of income seem to be inversely related to happiness and one can see that happiness depends on a lot more than material welfare. One just has to look at the Bangladeshi cricket supporters in the recent test with the Black Caps. Plenty of happy faces with an average income of $1,883 per annum and ranked 151 by the World Bank. This entry was posted in Behavioural Economics, Inequality and tagged Happiness on October 14, 2013 by Mark.